An avid fisherman knows that people aren’t always going to believe his stories, and while it’s probably a good thing that there was no recording device around when you described that 15’ bass that ripped the pole right from your arms, there are moments that you probably want to relive. That’s exactly what an action camera like the GoPro is for. It’s designed to capture those fast moments that you can’t get with other tools. 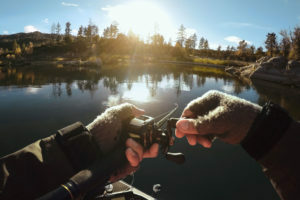 You can set the camera in place and watch your fishing escapades unfold just like the pros do.